The Nickel/Iron alloys can be successfully welded using most standard arc welding processes. In general, preparation for welding should be similar to stainless steels and should include proper cleaning and handling. Joint designs should allow easy access to the weld because of poor weld pool fluidity. Designs should also limit total weld volume to reduce shrinkage problems. Pre-heating and post-heating are not required and should be avoided. A low interpass temperature (300 F max.) should e maintained. 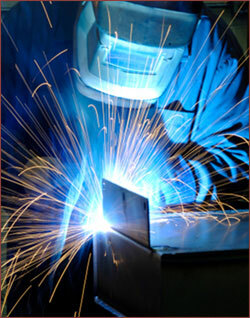 Welding is most commonly performed using the gas tungsten arc or gas metal arc process. Gas tungsten arc welding can be accomplished with Ar and /or He shielding gases. Welding is best performed with a freshly ground thoriated tungsten electrode. Gas metal arc welding can be successfully performed in all metal transfer modes depending primarily on base metal thickness. Shielding gases should be Ar or Ar/He mixtures. Other non-arc welding processes (ex. resistance) may also be used. When a filler metal is needed, a matching composition rod will provide the best match in thermal expansion properties. If a matching composition is not available a high nickel filler metal conforming to AWS A5.14 ERNi-1 or ERNiCRFe-5 can be used. These materials will result in a weld with different thermal expansion properties.